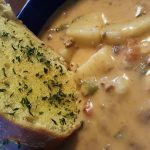 This soup is one of my favorites and is great on a cold winter evening. I love the cheesy flavor and each bite brings in hamburger and vegetables. This is a cozy comfort food you’ll crave all year long. And don’t be afraid of changing a few ingredients to suit your tastes. In a large (10 quart) pot, heat the olive oil. Cook onions and celery. until translucent and soft, season with salt and pepper. Add ground beef to pot, cook thoroughly, breaking up any large chunks. While pot is still boiling, in a separate pot, melt 1/2 cup butter (or margarine). Add flour once butter is melted. Mix until mixture is bubbling. Add to pot. Reduce heat to simmer and add heavy cream and cheese. Simmer until mixture thickens. 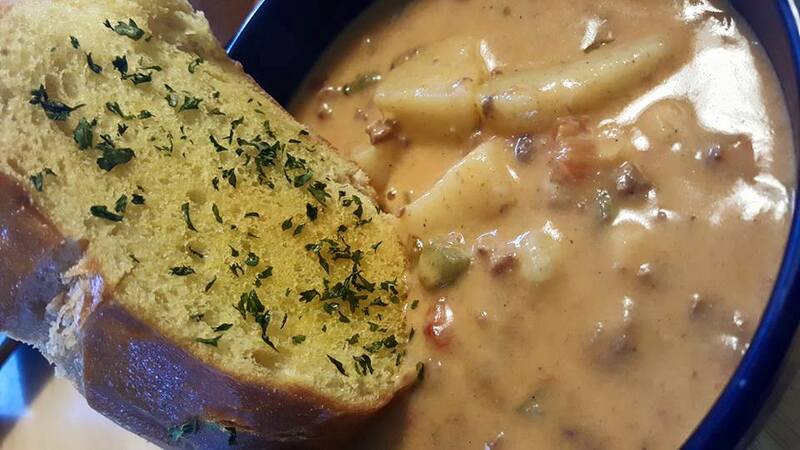 Serve in bowls with French bread (optional).